Fun read! I was also told they can drown in the water dish, so I put pebbles in my water dishes. Glad to hear this is not truly a danger! Yup, those damned cricket seem to love to end it all in one of my nice, clean water bowls. I’m guessing your right in that people witness that and think, “yikes, that could be my T!” The part that drives me nuts is that this rumor is STILL circulating, and all it’s doing is keeping people from supplying their spiders with water bowls. Slings especially are susceptible to dehydration, so it’s even more important that they have access to water. I have a couple tiny ones that I mist because I just can’t fit a dish in. It just becomes so dry in my house during the winter that I try to get a dish in for the ones I can. That moisture just evaporates soooo quickly when the humidity is down to the teens. Last winter, I actually took an old acrylic tank, reduced some of the air flow, and put a small critter keeper (without the top) filled with water in it. I then put my sling cages around this. The humidity in this container stays much higher than the outside, and I can spray the little boogers and not have it evaporate in an hour! Yes, moss is such a lifesaver for those tiny ones! Thanks! I was scrambling to find a way to keep them a bit more humid as my humidifier wasn’t quite doing the trick. The large enclosures are easier maintain micro climates in. Those sling cages, though…not so much. This is one of the most persistent of the myths, and it really is a case of “better safe than sorry.” The pebbles certainly won’t hurt and as C.J. Peter stated in another comment, it keeps the crickets from drowning. I give dishes to most of my slings starting at about .5″ or so, and I’ve had no problems with drowning. Perhaps not a myth, and in line with your “handle or turn demon-rage-kill-monster” section, but the ongoing scream-fest across social media between the “handlers” and the “no-handlers”. Both sides seem to just “know”. One side says “STRESS!! !” “The other side usually just fires back with “shut-it-peta-person”. Personally, stress seems to be indicated by defense or hair flicking and such…and yet some T’s will willing trot right onto the hand for a ride without doing ANY of the “stressss”(tm) stuff. Without anthropomorphizing, from behavior, this doesn’t appear to be related to “flight OR flight”, rather a choice to do something….and yet the screaming and arguing continues non-stop. Oh, believe me…this debate was in the back of my mind when I put that one out there. I tried to concentrate on the anthropomorphic aspects of handling (“my tarantula LOVES it!”) and the pressure some people feel that they have to handle to be real keepers. Not true. I’ve had several folks mention to me that they think that handling a tarantula is one of the “steps” that leads them to being an experienced keeper, and that’s just not the case. Personally, I don’t handle and it’s mostly because I know what I’m going to do if I get bit. I’m going to whip my hand back and probably kill my poor T by flinging it through the air. That said, I know that other folks handle all of the time without incident and that it’s really a personal choice. If do it responsibly and safely, and they stick to New World species, I agree that it can be done with no stress to the tarantula. Watching folks argue about this is amusing, because there really is no right or wrong answer. Unfortunately, both sides seem to like bringing it up in order to incite the other side. I mean, come on people…let’s stick to the important stuff. 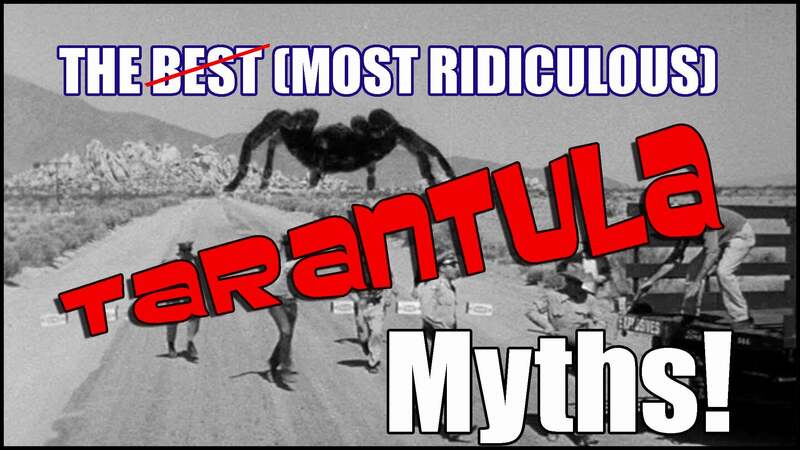 Thanks for this – I am so tired of correcting the more ridiculous myths, and most especially the ones that could harm someone’s tarantulas (I’d like to use the word “dispel” here, but millions of us could attempt to educate and there will always be “someone who knows someone who knows someone”… you know what I mean). My MM G. pulchripes, lovely daft old sod that he is, is just about touching 8” dls. People always seem to grab on to the fact that females are invariably larger than males – and therefore believe that the female G. pulchripes must be the size of a space station. I think people are disappointed when they learn that, even for a particularly big terrestrial species, he is unusually large for a male, and that the females will be his size, usually a little larger, but more stocky in build than my leggy beastie. I’ve fashioned water bowls out of golf tees for the few slings I have, and have found that misting them once a week has become completely obsolete now, for that very reason. I have to refill them more often than I have to refill the adult dishes, of course, but it’s less stress than getting an unexpected “rainfall” all over them. I mist only my arboreals, and the web of my P. murinus now, and my slings are thriving. As for the possibility of drowning, I’ve yet to see a prey item drown – let alone witness a tarantula getting into difficulty! Thanks for the article! 🙂 Even for as little time as I’ve been in the hobby I swear I’ve heard the “poisonous” line a million times! 😀 Though I’ll admit that I’d always assumed the “feeding vertebrate prey” myth was true. >.< I find one of the most common misconceptions (I don't really know I'd call this a "myth") from friends and coworkers that ask me about my Ts is that many of them believe tarantulas live very short lifespans… I guess just assuming "Well it's a bug it must not live long". My girlfriend actually bought me my B. Albopilosum sling and was SHOCKED when I explained just how long that penny-sized baby spider might live. 🙂 Thanks again for the article! Thanks so much! I was inspired after seeing a few of these pop up very recently on some social media sites. Holy cow, is there some strange stuff getting passed around as fact! I had read the myth about the vertebrates a couple years ago, and having a G. porteri that I used to feed thawed pinkie mice, I looked into it. There was just no proof, and the majority of Ts being fed mice were the giants, who often died during molts because of humidity issue. Also, in the wild, vertebrates make up a big part of many species’ diets. Plus, there are many folks who have been in the hobby for years who use vertebrates for some of their large species without issue. Personally, I still wouldn’t feed them because it’s a bad way for the poor mouse to go, and the bolus a rodent or lizard leaves behind is NASTY. They decompose faster than an insect bolus and they draw unwanted pests. And the smell…yuck. Yes! I agree that folks are amazed to discover that tarantulas live long lives. I have a G. porteri that’s pushing 25, and people think I’m lying when I tell them her age. You’re cool Tom, thanks for the knowledge. Although it isn’t necessary to feed a bird to a tarantula, it is physically possible. Feeding a newborn chick would be the most sensible option in such a scenerio. Nevertheless, here is L Klugi doing just that. In nature, a bird with a broken wing or a chick that fell from the nest might be consumed on rare occasions. Likewise, feeding mice or lizards to tarantulas is unnecessary.